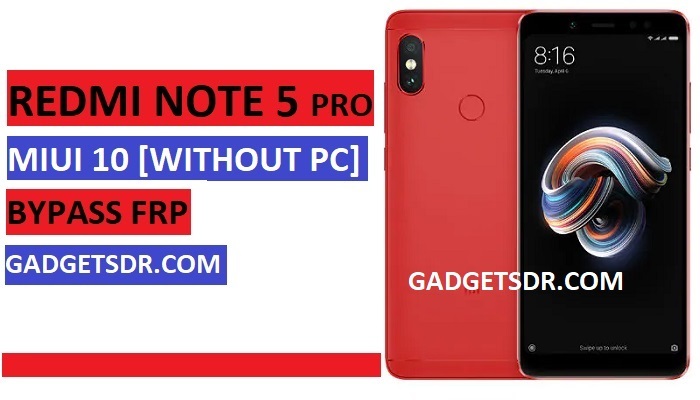 Redmi Note 5 Pro Bypass FRP MIUI 10 (Latest 2019), Here we share with you how you can easily Redmi Note 5 Pro FRP Bypass (Latest 2019). Is your device Stuck on Google Account verification screen then its very annoying so that’s why we share here the latest method to Bypass Google FRP Redmi Note 5 Pro MIUI 10. through this process, you can easily add a new Gmail id and bypass google account verification to access your device again. Before you follow this process only you need a working PC and download some files to Bypass Google FRP Redmi Note 5 Pro MIUI 10. All files and step by step guide on below, Please Download and follow all steps very carefully. -Now tap on the clock icon to Bypass Google FRP Redmi Note 5 Pro Miui 10. -After that, now click on the”google search bar” and download some frp tools. Note:- following this process you need only one apk to Redmi Note 5 Pro FRP Bypass Miui 10 MIUI 10. -Congrats, Now you can access home screen of your device but still frp lock is enabled so now follow the final steps to Bypass Google FRP Redmi Note 5 Pro. -Now you have successfully followed the process to Redmi Note 5 Pro FRP Bypass MIUI 10. Thanks for visiting us, Comment below if you face any problem With Bypass Google FRP Redmi Note 5 Pro MIUI 10, we will try to solve your problem as soon as possible. you can check other some tutorial here to help you.